1	Preheat the oven to 180°C, gas mark 4. Butter and line a 20cm-deep, loose-bottomed cake tin. Cream the butter until soft, then beat in the caster sugar and orange zest, and continue beating until pale and fluffy. Beat in the eggs a little at a time. Fold in the polenta, baking powder and ground almonds to give a soft mixture that drops easily off a wooden spoon. Spoon half the mixture over the base of the cake tin. 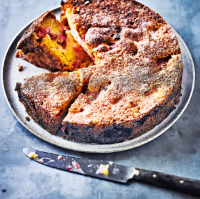 2	Arrange the rhubarb over the cake base, then drop the rest of the mixture over the top, leaving some gaps. Bake for 1-1¼ hours until well risen and golden and a skewer inserted into the centre emerges clean and dry. This recipe was first published in Thu Feb 15 12:02:03 GMT 2018.